Elizabeth Bear at the LitFest in Trollmouth at 2pm SLT today! Please join us as we welcome Elizabeth Bear to Trollhaugen for the first two very special events. 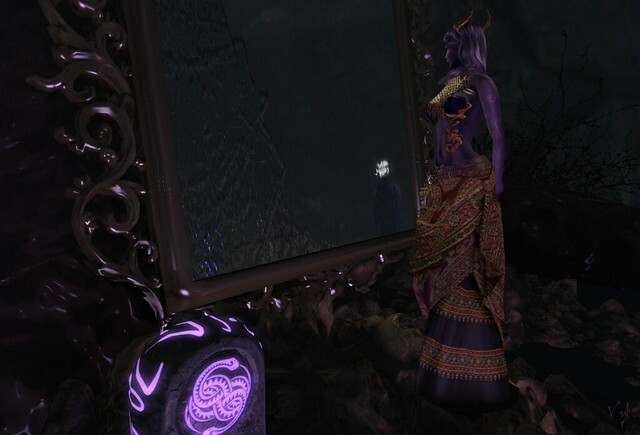 On Tuesday, April 23rd, 2:00pm – 3:00pm she will arrive at the Fantasy Faire in her avatar form for an interview in Trollmouth. The Company of Faire Folk will be riding out! or What are the LitFest Tours? Every day at 5 PM SLT the Company of Faire Folk rides out from our meeting place in Trollhaugen to explore the Fairelands, each day visiting a separate Land. The Tours are led by Saffia Widdershins, with special music appropriate for each Land usually supplied by Nyza Stillwater (the opening day featured Music from ColeMarie Soleil, and on April 23rd and 24th by Astoria Luminos). Even if you can’t make the Company Riding Out, you can still do the LitFest Tours and submit your stories and poems for inclusion on the website! Greetings Fairelanders! Duchess here with some fantasy fashions that are available at Fantasy Faire 2019! My fae-ful friend, Kynne, joined me on the mystical sim, Light of Va’loth, that was designed and built by one of our favorite Second Life builders, Kilik Lekvoda of Titans and Solarium! Light of Va’loth is bathed in sweet hazy hues of amethyst and lit with brilliant rays of light emitted from the treasured Lady of Light. The stone structures are enveloped in tangled vines, shaded by ancient trees and relaxed by the sounds of the cascading waterfalls and babbling brooks. The sim is breathtaking and enticing and worth every second of your visit. As we write this, Elizabeth’s chasing late-arriving merchants, Zander’s in studio producing pieces for FFR and David’s on top of a tower watching the check-in team working to help those merchants who’ve already arrived and set up their stores. It’s the Faire in a nutshell: everyone working in their own tasks to create a larger whole, and that again is a snapshot of Relay, which is a snapshot of the fight against cancer. Last year, we said “We’re all builders now.” It’s still true: the Hope Hostel at Kenyatta National Hospital is almost ready to begin, and by the end of this Relay season we’re pretty confident that they’ll be ready to break ground, but we’re building – and we have built – more than a place for people to stay. We’ve built a home here in the Fairelands that we each take with us when the mists return and we go our separate ways for another year. We’ve built a dream of a better world – one where cancer is easily treated and where survivors and caregivers no longer have to face the struggles they do now. Most importantly, though, we’ve built a community. The Halls of Story were a dream, a dream within a dream, or simply such stuff as dreams are made on. This was a land conjured up firstly by words. In the years that followed, by paint daubed on walls and gradually, over time, by ink until eventually its existence was woven anew by tiny squares of light grouped and shaped into characters which breathed life into the Halls.